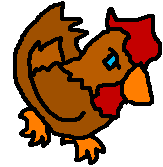 Here I have drawn a simple chicken, so that y'all don't forget what this site is all about. This chicken is somewhere between my usual style and my rounder, cuter style. Well, I could say that but really I just drew it and this is how it turned out. So, I hope you like this simple chicken. Cause I need a break from themes and crazy styles sometimes. You got it Catherine. That will be out... vaguely soon. Patricia, thank you very much.